View from my apartment window at dusk. Since I've been in London I've insisted on experiencing London everyday. I've been motivated by an underlying concern that I can't waste the opportunity of being here. The weather in London has provided me no excuses to stay in and just be quiet, as the usually rainy weather has been unusually sunny. So every day I march out and see a sight or do something London-y. But a couple of days ago, the rain finally came, and I was relegated to sitting in my apartment all day. I cleaned, organized and read until there was nothing left to do. 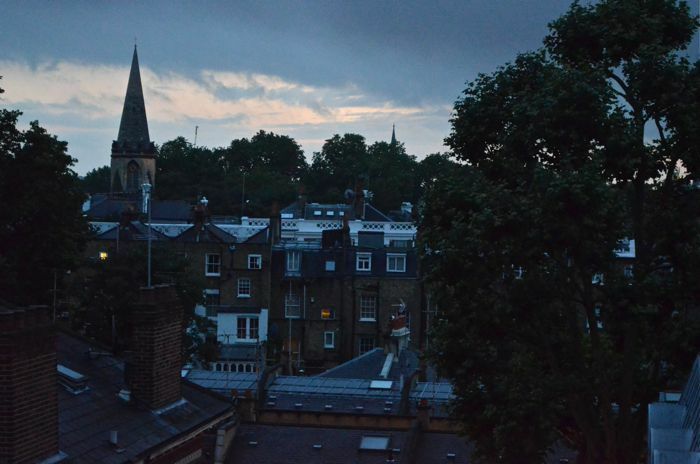 I found myself sitting on my couch, just staring at the rain, and then through the rain at the spire of the V&A, the rows of little chimneys, and the steeple of the couple-hundred-year-old church a block over. After the rain passed, the clouds cleared, and a little bit of sun peaked out before it went down. I realized that this, too, was living in London. And I couldn't help but think how very fortunate I am to be here for all of it.